Upgraded for rental 2017!! Now including free unlimited WiFi !! Central Location!! Central Location!! Central Location!! Why choose anywhere else other than Orihuela Costa's sought after 'La Zenia' beach resort on the Costa Blanca? As you travel along the coastal route of the N332 on a short journey from either Alicante or Murcia airports, La Zenia resort lies approx halfway between the two, making flight choice easy. Situated within just minutes walking distance of a selection of beautiful award winning blue flag beaches, the fantastic La Zenia shopping centre, and Punta Prima, Playa Flamenca and Cabo Roig resorts all located close nearby. La Zenia is a quality thriving central holiday location, just off the N332 and a short bus or taxi ride will take you into the bustle of Torrevieja city centre with its shops, markets, beaches, bars, restaurants, fairground and water park. This fantastic, warm, south facing, 2 bedroom apartment has a south facing balcony with open views across to Cabo Roig, and features a lovely heated outdoor communal pool. It is also just 3 minutes walk from a hive of activity in La Zenia centre, with dozens of bars, restaurants, live music, shops, Irish pubs, medical care, gift shops, supermarkets etc - all right on your doorstep!! The accommodation is also just 5 minutes walk from the renown Orihuella Costa resort complex, perfect for spending days in total relaxation (check out their website). The area is level for easy walking, and within a 12 minute walk you will discover the superb, award winning sandy beaches and bays of La Zenia and Cabo Roig, and the recently opened fantastic La Zenia boulevard shopping centre complex, full of all the familiar brand names, designer and Spanish retail outlets, restaurants and bars. You simply do not require a rental car for this apartment!! Save yourself hundreds on the car rental cost and spend it more wisely, eating, drinking, relaxing and enjoying your holiday!! This apartment is situated on the 2nd floor and has exclusive access by modern lift elevator and stairs. In particular, the lift makes it very accessible for wheelchairs and for those with special needs. This complex has general wheelchair access and stair ramps and this particular apartment block has lifts to ensure easy access to the apartment. All clients greatly appreciate and benefit from this being a fully managed apartment, where our property manager will meet and greet you at Molino Blanco II with apartment keys on arrival, show you to and around the apartment, and will also provide a welcome grocery pack of essentials, water, tea, coffee, sugar, milk etc to help you quickly settle in and enjoy holiday mode! (for 7+night rentals only). We want you to gain the maximum benefits by choosing this apartment, and unlike other rental accommodation, we will not be charging for any additional fees on arrival or departure!! The meet and greet, the welcome grocery pack, and even cleaning costs are fully inclusive within your rental package and price!! For peace of mind, in the unlikely event of an emergency problem (ie, lost keys, appliance breakdown etc), our British local property management company will assist if required, ensuring your holiday is not adversely affected by unforeseen circumstances. Your holiday is as important to us as it is to you. That is why go that extra kilometre to provide all these inclusive services and benefits which you may not find with similar rental accommodation! The apartment itself is newly and tastefully decorated, modern, and in excellent order, fully equipped with items required for up to 6 people staying. There are two bedrooms, and a double sofa bed in the lounge, with an additional pull out bed under the sofa bed. In addition, there is Astra satellite with a full range of British TV channels. There is also a CD player and radio, alarm clock, hair dryer, and all the usual modern electrical kitchen appliances, kitchen ware and cooking utensils are present. An independent hot water tank ensures you have hot water on demand, and both bedrooms and lounge are fitted with large ceiling fans to keep you nice and cool at night. There are also additional floor standing fans if required. The apartment features a lovely south facing balcony with totally open views across La Zenia towards Cabo Roig resort and beyond. There is also a rear store-room balcony from the kitchen to help keep the apartment clutter free, especially with kids! All clean bed linen and towels are supplied for the duration of your stay, meaning you can travel light and save airline fees on larger cases. The communal heated pool is security gated, meaning only Molino Blanco II residents can gain access and a security key is supplied. The pool is under one minutes walk from the apartment (see photos) and is south facing for maximum sunshine and tan! There are street bars and restaurants, phone and internet shop less than 100m from the pool. Plastic chairs and sun chairs are in the apartment and subject to poolside space, can be taken down to relax but remember to return them to the apartment afterwards! This private development has mix of nationalities, predominantly British, Irish, Scandinavian and Spanish. It is a great community where respect, behaviour and decency is observed. The president of the community is British and lives on site, so please respect others living and working, particularly with noise levels in the evening. Molino Blanco II is not for the rowdy and unruly, although the La Zenia bars just a few minutes walk away will have all the entertainment, action and live music that you could possibly require!! Also, within very easy reach from La Zenia, just along the N332, you will discover many additional bars, pubs, clubs and restaurants at Punta Prima, Playa Flemenca and Cabo Roig resorts, many with live music and entertainment until the early hours every night. La Zenia is central to all of these local resorts and provides for a great variety of activities both day and night to suit all ages and tastes, including motor go-carts at Playa Flemenca. Children of any age are generally welcome in most bars and pubs, and there is little or no restriction on curfew times for the little ones. 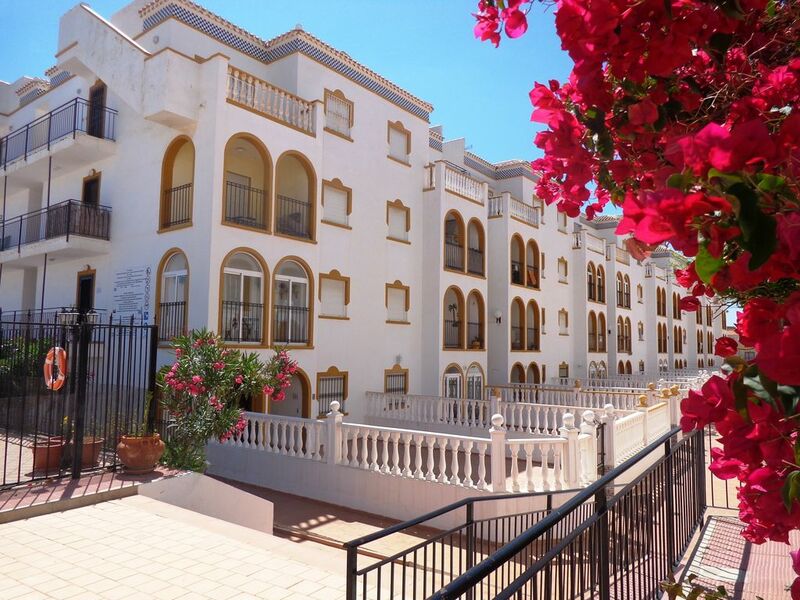 With this centrally located south facing apartment, La Zenia has everything to offer! Please contact me by telephone or email should you require any further information or to make a booking. We can also arrange personal airport pick-ups and transfers (at additional cost) so please ask if this is required. Family with children between 13 and 25years old south of England now living in Nottingham. Having owned a family house on the Alicante side of Torrevieja for the last 10 years, we have come to know the Costa Blanca region really well. As a family, every year we end up spending virtually every holiday in the La Zenia resort due its fantastic location, superb beaches, beach hotel swimming pool complex, and all the restaurants and bars. It is a very friendly, family safe area, many British and Irish live permanently and yet it feels very much like Spain! La Zenia is considered a high quality resort, and it is central to Cabo Roig, Playa Flamenca and Punta Prima resorts, all situated either side of the apartment location. There is no end of activities day and night within all the localities, yet it is just a short bus or taxi ride directly into Torrevieja city centre and all that the city has to offer. La zenia and its surroundings locations are very family friendly, the spanish are terrific, and it is very rare to see any kind of disturbance or yobbish behaviour. Anywhere in or around this region. Having been asked to rent out our house on many occasions, we have always declined, and took the view that if we managed to secure the right property in the best location, one which we could highly recommend to family, friends and those looking for a fantastic, relaxing, safe and memorable holiday. We would then have achieved our goal. Location is everything, and this Spanish style apartment in central La Zenia has just that and more!! Perfectly positioned just 2 or 3 minutes walk from amenities. It is also one of a limited number of properties in the stylish Molino Blanco ii development that is truly south facing, attracting the sunlight all day, with completely open views from the balcony and bedroom across to Cabo Roig and beyond. It is also exclusive in that it has special needs access and is particularly great for those of an older generation with modern lifts to the 2nd floor to avoid the stairs. The communal pool is heated all year round by solar panelling, so whether it be off season or in the height of summer, the water temperature is beautiful. The pool is less than a minutes walk from the apartment! With both the newly opened La Zenia boulevard shopping centre and the award winning beaches within easy walking distance on level ground, a holiday in La Zenia will have something special for everyone. Whether you are looking for lively bars and clubs, music, quiet and romantic restaurants, great golf courses, or just a stroll along the wonderful blue flag beaches, La Zenia and its nearby locations has everything to offer for all ages! basin, bidet, bath, toilet, bath, shower mixer, storage vanity unit, illuminated mirror, non slip bath mat, shower caddies. suitable for special needs as development has stair ramps for wheelchairs and modern lift elevator to 2nd floor. South facing balcony with open views. dining either in the lounge or on the south facing balcony. development has stair ramps into the complex and this particular apartment block has modern lift elevator to the 2nd floor to access the apartment. with childrens area. South Facing, one minute walk from the apartment. Please see full location and accommodation descriptions for all information. On arrival we were met by the key holders Joanne and Darren who were great and could not have been more helpful. The apartment was very clean, light and had everything we needed and more. Pool area was very clean and secure and never a problem to find a space to put sun loungers. The property was convenient to restaurants/cafe's, supermarkets, banks etc. We found some amazing restaurants. The apartment is situated in a great location. Would highly recommend and we will be definitely going back next year. Very enjoyable stay. Lovely property near beaches, shops, restaurants, etc. Great location for adults and children. Very clean and location for us was perfect. We were very pleased with the transfers to and from the apartment. There was everything we needed , beach towels chairs etc. but other wise it was great thanks again to Joanne and Darren. We stayed for 11 days at this apartment. We had a lovely relaxing time. The apartment is spotlessly clean. Everything you could possibly need and more is supplied. This includes chairs and towels that can be used around the pool. The owners gave us a lovely warm welcome. We loved La Zenia. Everything is within walking distance including 3 large Supermarkets, lots of shops, bars and restaurants and the Boulevard. The seafront and beach is about 10 minutes walk away. All in all it was perfect for us and we will be back later this year. Everything that we needed for our stay was there. Apartment is adequate in size for 4 people, Joanne, the owner, couldn't have been more helpful and always available. Walking distance to shops and beach. Plenty of eating places nearby. This stylish, modern, newly decorated apartment is situated in central La Zenia beach resort, considered one of the top quality holiday locations on the Costa Blanca, three minutes walk to dozens of great local bars and restaurants, 12 minutes walk to the superb La Zenia and Cabo Roig award winning blue flag beaches, and just 8 minutes walk to the fantastic newly opened La Zenia Boulevard shopping centre. With bus services and taxi's right on your doorstep, its just a short journey into the bustle of Torrevieja city centre with its own beaches, markets and city amenities. La Zenia is also central to other popular localities all with their own commercial centres, being Cabo Roig, Playa Flemenca and Punta Prima resorts. Access to all of these is perfect from this central La Zenia apartment!! La Zenia is also perfectly situated to reach some of Europe's top golf courses, Campomar Golf Club just 5 minutes by car, Las Ramblas, and Villa Martin all within easy reach. £150.00 Security Bond is refunded by electronic bank transfer within 14 days of departure date subject to property management inspection report. A Clients Detail Form will be emailed/posted for completion after 50% deposit is paid. RENTAL RATES ARE FULLY INCLUSIVE OF CLEANING COSTS / PROPERTY MEET AND GREET / PROPERTY MANAGEMENT. FREE ON ARRIVAL GROCERY ESSENTIALS PACK FOR 7+ NIGHT BOOKINGS ONLY.